Or maybe I am just the definition of INSANE! We are now on our third white tarp for over the pool, actually the poor man's/woman's version of a sailcloth. To us commoners it looks pretty much the same. Oh the reason we are on our third white tarp is because of our summer storms, each and every year, yep the winds do come with them quite often too! And that INSANE reasoning of mine is not lowering the sailcloth AKA white tarp with known daily warnings they the tarp/cloths can only take so much windy abuse! Doing the same dumb, not to worry to lower it answer I said to Hubby, apparently two mistaken times too many... thus the INSANE nearly diagnosis, ha. As Albert Einstein so aptly put it, " Doing the same thing over and over again and expecting different results." Is the definition of insanity! So that is how the grommets ripped out or the entire poly tarp, not canvas sailcloth shreds! Yes, two different outcomes, but just as detrimental for future usage. Although, Hubby does have a grommet installer, and I did suggest it might work for this last one's repair, if not it does make a different other than blue, or not usual leaky roof cover if we were to get another hurricane and that one did rip our roof off! Nah...HOPE NOT, been there done that in 2004!... no fun! And that is why we did go out yesterday, since we had ordered a new one from Home Depot online, since they do not carry white ones in the store, and when it is sent there it is free delivery! 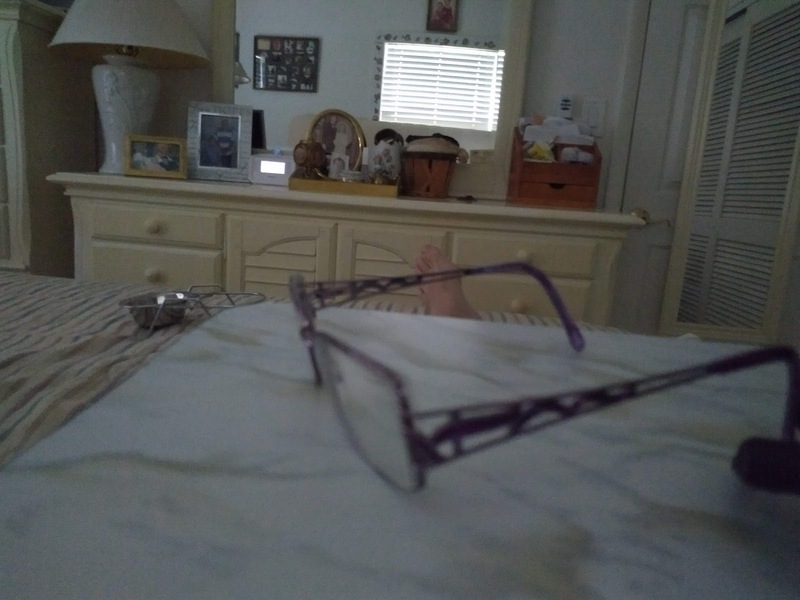 But I also had my new transitions eyeglasses to pick up at Visionworks, my last several pairs have been transitions, quite practical in Florida, no need to constantly switch from regular to sun ones, living in the Sunshine state and all! when I ordered my new glasses, and she was wonderful. I had picked out one pair that I took over to the sales clerk and when I got the price on it, it was way over one hundred bucks higher than what I wanted to spend. Diane, the salesperson showed me a pair of metal sculpted purple ones on sale, half the price of my first choice, and we all know why... I had never had purple frames before, so I went for it! These could make me a purple frame star like Sally Jessie Raphael of talk show fame, as she was with her signature red frames! But where would that be? Better think on that one...ha! 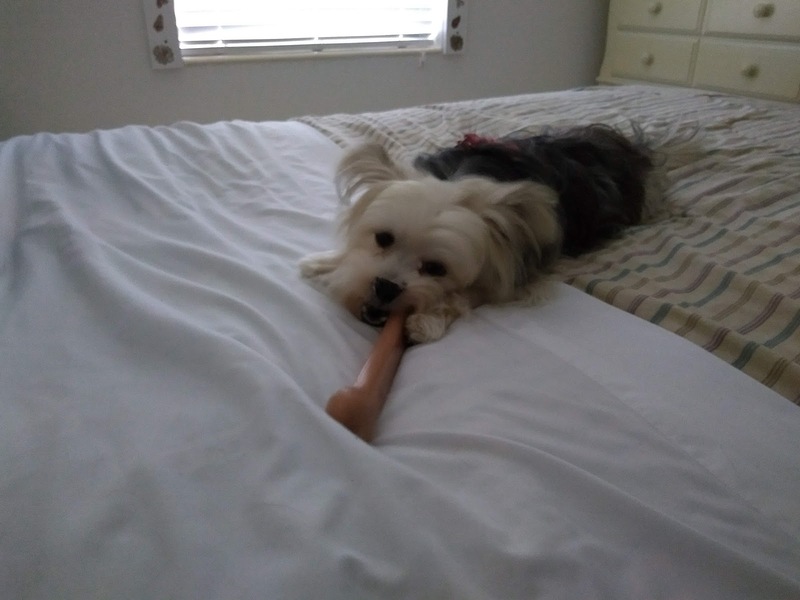 Meanwhile, or added interest again....... here's........ a PIC of Bella chomping on Aussie's non Kosher bacon flavored Nylabone! Who would of thunk it, she tackling such a BIG thing, BIG AMBITIONS, and at her age of either three or four, got two different ages and birth dates from the adoption agency! July 18, 2014 and August 18, 2015, INSANE again! Which one should we choose?